What Does A Duplex Investor Look Like? | Your best resource for buying, selling, owning and investing in duplexes and duplex homes. What Does A Real Estate Investor Look Like? When you think of a real estate investor what picture comes to mind? Donald Trump? 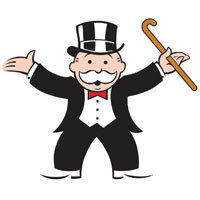 Monopoly’s Rich Uncle Pennybags? After all, it takes a lot of money to invest in real estate, right? According to the Distressed Property Institute, the median annual income for a real estate investor in 2009 was $87,200. While this is higher than the $72,900 median for those buying primary residences, it is nowhere near the Trump-osphere. Actually, nearly half (43 percent) of investors made less than $75,000 per year. In fact, those who made less than six figures a year outpaced those who made more by a margin of two to one. Apparently, Mrs. Trump and Mrs. Pennybags need some credit as well, as 78 percent of all real estate investors were married couples. Not only are most real estate investors not rich, they’re also young. Only 22 percent of real estate investors are 45 to 55 years old. In fact, a whopping 50 percent of them are under the age of 45! If you’ve been dreaming of becoming a real estate investor and didn’t think you fit the mold, know this: there’s never been a better or more affordable time to jump into the market. You can start small. And there’s plenty of opportunity.